.......53 Buddhas and Me .................My Life Adventures.....: "Fish Watching"
I have had quite a lazy day today, even to the point of having an afternoon snooze. But to my plan I did accomplish one of my items on my list. Just for those who don't know I am a real list person, if it's not written down it pretty much gets lost in the never nevers!! This morning I got up bright and early and cleaned out my fish tank. It is about a metre in length so when it gets done it is a pretty big job. I can't say it's a job I particularly enjoy, but when you have trouble seeing the little fellas swimming about you know it's time. So after a couple of hours bucketing water, cleaning rocks, dividing plants and then getting the water chemicals correct I was able to put my little fish back in their home. 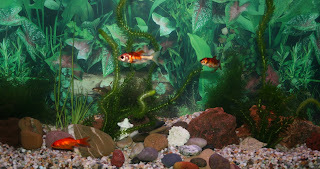 It is so nice and relaxing sitting of an evening and just watching the fish swim around. One of them has great fun in the filter bubbles. Every night for hours at a time he swims up to the filter and lets the bubbles "swoooosh" him down to the other end of the tank. I know people say that fish only have a memory of a couple of minutes, but mine sure remember things. I guess I just have very intelligent fish.